Just two weeks ago I began my journey with Windrose Farms as a personal assistant to Barbara. Having been involved in the management of two other sustainable farms in the past, Windrose looked like my farm dream come true. I was loosely familiar with the term “biodynamic”, but knew I had a lot more to learn on the subject. To that end I began researching online, and to my delight found there is a veritable cornucopia of literature on the subject… an entire century’s worth, in fact. Google “Rudolf Steiner” (the founder of biodynamics), and you will immediately be overwhelmed by essays, lectures and treatises on a wide array of subjects including, but not limited to: spiritual development, agriculture, architecture, social reform, philosophy, theology, and psychology. The man was prolific to say the least, and in just one lifetime accomplished more that most could in a hundred lives. Being that there is already exhaustive information on the web about Steiner and his philosophies, I will let the reader explore them on their own, and instead focus on Bill and Barbara Spencer’s take on the matter. A loose definition of biodynamics would go something like this: A system of agriculture, which views the farm as a cohesive unit, a distinct eco-system with its own particular needs and idiosyncrasies. Such an eco-system necessitates a high level of biodiversity and is ideally self sufficient, meaning inputs such as animal feed, compost and fertilizer come from the farm itself instead of an outside source. 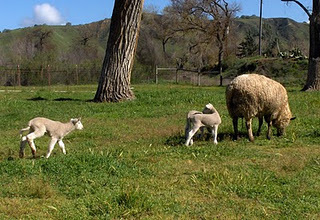 Therefore biodynamic farms incorporate livestock, usually ruminants such as cows, goats, or in our case sheep, into their crop rotations and cultivation cycles. These animals eat weeds and organic matter left after harvest, and in turn provide fertilizer and compost for future plantings. Another very important and somewhat unique tenant of biodynamic agriculture is the recognition of the spirituality of farming. Biodynamic farmers recognize that there are forces at work on their land that are as yet unrecognized by science. In the words of Bill Spencer, “I view biodynamics like organized religion, in that it is man’s attempt to codify that which is obvious to most reasonable people, that there is a spirituality to life. Barbara and I avoid the dogma that tends to come with such a codified system, and instead benefit from the knowledge of eco-spiritual systems that biodynamics provides. The Spencers have a few more hurdles to clear before they can be certified biodynamic, but every day brings them a little bit closer. According to Barbara, even if they never get officially certified, they will continue their commitment to biodynamic principles and methods. If you are interested in learning more about biodynamic agriculture, visit The Biodynamic Farming and Gardening Association’s website.